Isotoxin is a feature-rich secure messenger that lets you connect over your local network or the Internet. The program supports audio and video, desktop sharing (view only), file/folder sharing, inline images, group chats and user profiles. Available extras include spell check, avatars, themes, auto gain / noise filter for audio and much more. The Tox protocol is peer-to-peer, meaning no central server is necessary for the network to function. 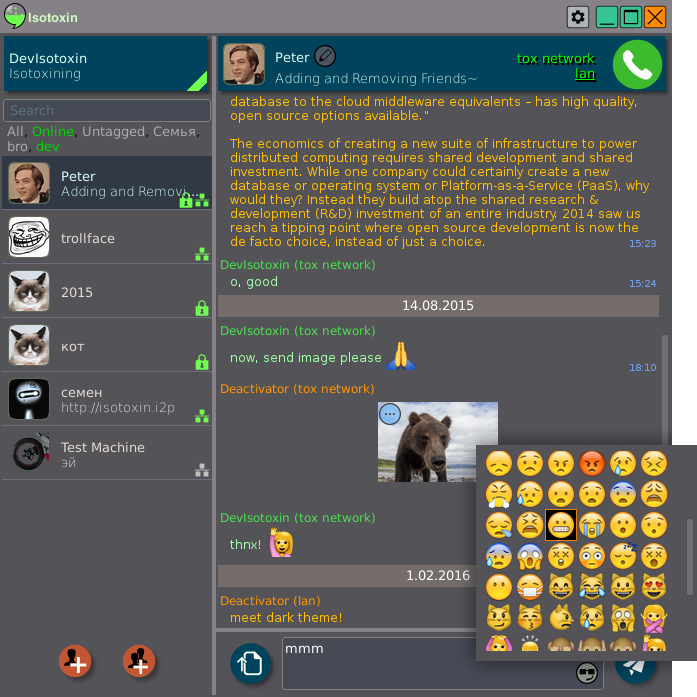 Includes basic support for the XMPP (Jabber) protocol. Markdown syntax parsing can be disabled. Compact view of contact list. Received image treated as new message. toxcore updated to toktok 0.2.0. @Realist - Just go to web.whatsapp.com. Their "app" is just a wrapper for that. @Realist: I haven't tested it because, unlike Isotoxin, WhatsApp is only out for Win8 and higher, closed source, and and is owned by Facebook. Their Wikipedia page lists some other concerns. Note that the 32-bit version is about 11 MB uncompressed while the 64-bit one is about 13 MB uncompressed.